Trinity’s Apprentices – Top of the Class! Trinity Fire & Security Systems are extremely proud to announce that two of our Apprentices, Josh Williams and Sean Reynolds, have been invited to the National Apprentice Security & Fire Excellence Awards in November. 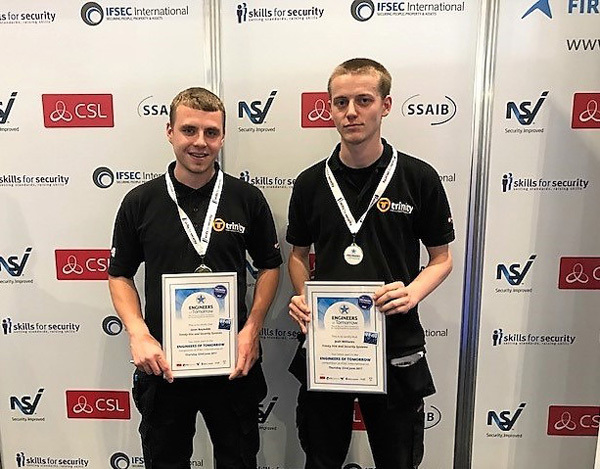 Josh and Sean entered ‘The Engineers of Tomorrow’ competition, which sees young security apprentices compete against each other in a live installation challenge, the competition was held over three days at London ExCeL. With an ever growing engineering skills gap undermining the industry, as well as the wider economy, the need for such an event has never been greater and the competition pitted more than 60 young engineers – working in teams of two – against each other. Josh and Sean won their heat and have now been invited to the Security & Fire Excellence Awards in November, where an overall winner will be announced. The winner will claim a £1,000 prize. “We have always been focused on training apprentices within the Fire & Security Industry and we are extremely proud that our Apprentices have been nominated for the Security & Fire Excellence Awards , their nomination is a remarkable achievement as this is the first year Trinity have entered the competition. We have recruited almost 40 Apprentices over the years since starting with the Gent Fired Up scheme and now we regularly look to recruit around 10 apprentices a year”. “Well done Josh and Sean”.